The prime minister has secured “legally binding” changes to her Brexit deal a day ahead of MPs voting on it, says the Cabinet Office minister. David Lidington said the changes will mean the EU “cannot try to trap the UK in the [Irish] backstop indefinitely”. But he said further negotiations are taking place as the PM is still meeting EU officials in Strasbourg. Shadow Brexit secretary Keir Starmer questioned whether any changes had been made to the withdrawal agreement. Theresa May flew out to the European Parliament late on Monday with her Brexit Secretary Steve Barclay for last-ditch talks ahead of MPs voting on her deal on Tuesday. 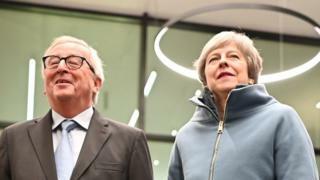 In the discussions with European Commission President Jean-Claude Juncker and the EU’s chief Brexit negotiator Michel Barnier, two documents were agreed by all parties, which Mr Lidington said would “strengthen and improve” both the withdrawal agreement from the EU and the political declaration on the future relationship. The first is a “joint legally-biding instrument” on the withdrawal agreement. Mr Lidington said it could be used to start a “formal dispute” against the EU if it tried to keep the UK tied into the backstop indefinitely. The second is a “joint statement” adding to the political declaration to commit to replacing the backstop with alternative arrangements by December 2020. Mr Lidington said: “The House was clear on the need for legally-binding changes to the backstop. Today we have secured these changes.